A big thing missing from wrestling today that was prevalent when I was a young fan watching is the role of a manager. It's a relationship that started crumbling many years ago. I'd love to see more managers or even valets second WWE Superstars to the ring. I get that most Superstars today don't need a mouthpiece, but I miss managers at ringside. 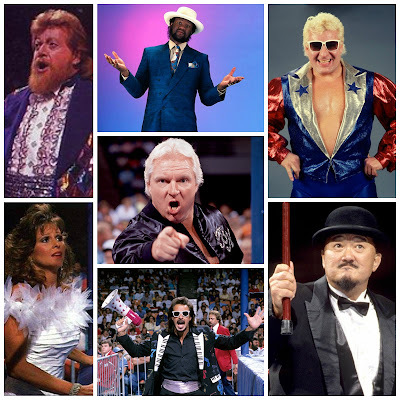 So flashing back to Survivor Series 1987, I'm going to pair up managers from that era with Superstars of today. There were seven managers on the roster at that time so I've split them up and put them on separate rosters and paired them like this. Most of the choices are based on the similarities the Superstars of today had with the men that were managed years ago. I tried to stick with the same number of Superstars that the managers had in 1987. Obviously, this time around there are more women wrestling. Also, not everyone on today's roster is represented as I don't think everyone needs a mouthpiece. That's not to say Kevin Owens and Chris Jericho do, but I think Heenan with those two would be amazing. It was a bit more challenging keeping managers on one show instead of sharing the entire roster.